Leopard Mountain Game Lodge is set in the 23000 hectare Big 5 Zululand Rhino Reserve Located between Hluhluwe and Mkuze Game Reserves within easy reach of Ndumo, Kosi Bay, Sodwana, Lake Sibaya and the St Lucia wetlands. Enjoy total peace and tranquillity and warm friendly hospitality at our exceptionally beautiful and award lodge which has the most spectacular views in Zululand from the river meandering below to the distant Lebombo Mountains. 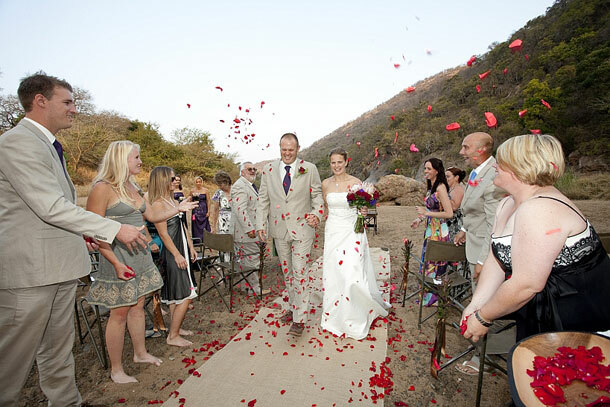 Leopard Mountain Game Lodge is the perfect destination for newlyweds wanting to truly enjoy their honeymoon. The exceptional service, tantalizing cuisine and romantic setting will leave you spellbound and wanting to return for your anniversary. This unique setting offers the ideal backdrop for your intimate wedding. The natural bush veld surroundings combined with close family and friends will create a magical ceremony perfect for your ‘I do’s’. Wake to a new day in luxury … ready to create those memories we all dream of creating..
To arrange your wedding at this lovely venue visit Leopard Mountain Game Lodge.